Given the horrific mass-shooting in Orlando over the weekend, it seems irreverent and off-point to scribble about the usual grist for the mill. So a bit of catchup and forward-looking stuff. –I’ll have a great interview in tomorrow’s WaPo with CBPPs Elizabeth McNichol on the need for infrastructure investment, with an emphasis on the state and local dimensions. Read her recent paper for background. –The Fed meets this week to probably/hopefully not move on interest rates. I’ve got another piece coming out later this week arguing that this is a good thing. Given very low interest rates across the globe and volatile capital flows, even a small tap on the breaks could slow the economy a lot more than planned, drawing in capital, strengthening the dollar, and exacerbating the trade deficit, with no room to offset the drag through monetary or fiscal policy (the former’s constrained by the near-zero-lower-bound, the latter by dysfunctional politics). –I testified in the House last week (for almost three hours!) as House Republicans tried to kill the Obama administration’s new overtime rule. Here’s my spoken testimony and here’s the longer, written version. No one will be surprised that the R’s want to block the updating of the threshold, which, as the figure below shows, even with the new update, is only partially back to where it was in the mid-1970s. But I was struck by the depth of their negativity, by the extent of their rancor at the new rule. They really can’t abide middle-class people catching a break on this one and are deeply frustrated that they may not be able to stop it, much like the ACA. –I took off from a WSJ piece on student debt to think about the factors that distinguish between good debt and bad debt. –Riffing on Paul Ryan’s nothing-burger of an anti-poverty plan on the Talk Poverty podcast. I won’t veer much out of my lane and get into the Orlando shooting other than to offer a few links and a thought or two. —This piece by Richard Kim really resonated. It includes some curse words, as it should. –This political analysis from the WaPo seemed about right to me. Above I note how political dysfunction blocks needed fiscal policy. Fine, whatever…we can debate that. But what’s so deeply frustrating and scary about this last in a series of these murderous events is that the same dysfunction blocks necessary action against such attacks. What’s that? There’s nothing that could have been done to stop this given that the guy was a security guard with legitimate gun licenses? Well, how about this? : if you’re someone that the FBI has interviewed twice because of concerns about the danger you might pose to society, and you’ve recently purchased an assault weapon, a light goes off somewhere and law enforcement looks you up and keeps a very close eye on you. Again, I don’t mean to tread outside my expertise, but I was in the car yesterday listening to about an hour of analysis about the killings and all I heard was endless chatter about whether this was terrorism, hate crime, blah, blah. What does it matter which demons got inside this madman’s head? Would it be less of a tragedy if his toaster told him to do it versus his sick, twisted version of religion amped up by homophobia? I’m not at all saying such analysis is unimportant; as Kim points out, the assault on a gay club is a particularly wrenching aspect of this tragedy. But I am saying that when I hear such an emphasis on motivation and so little on prevention, I’m reminded of the incredible and impenetrable dominance of the gun lobby (see Michael Cohen on this point). Share the post "Catching up on some old stuff"
2 comments in reply to "Catching up on some old stuff"
I think this is another reason you don’t call it “radical Islam” as that gives theses nut cases too much credit and the justification they are looking for. And thanks for spending those three hours testifying. Anyone want to try to explain why the minimum exempt amount was not raised to the level adjusted for inflation? 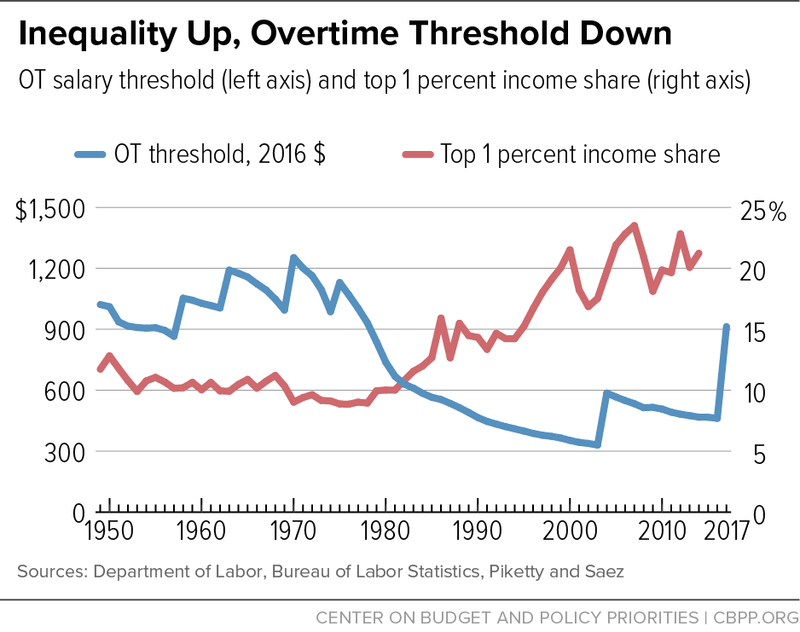 I’d speculate it’s because America has slid so far backwards in wage protection that we just can’t conceive of giving overtime to the middle class. Evidently we used to. No one wanted to admit that people earning $60,000 a year still need labor rights guaranteed in (universal vs labor contract) law. Keep in mind adjusting for inflation doesn’t factor in the productivity gains that accrued to any given salary, so that employers would still benefit by limiting the increase to inflation instead of inflation plus productivity. This 3/4 measure enacted at the end of Obama’s 8 years in office goes to the heart of what has afflicted his economic policy. It should have come much sooner and been phased in to levels previously held, and politically emphasized that these were levels that sustained good economic conditions under previous Republican administrations. It’s about a “restoration” to tried and true, not new, not radical, not leftist. For good measure I’d add “exempt” status is still highly questionable and abused, everyone is a manager or professional, and in the 1990s tech workers got a special exempt provision to protect Microsoft, IBM, which now indirectly helps Google, Facebook, Apple also, suppressing wages for all due to ripple effect. Good debt, bad debt, is ignoring the glut of over qualified college educated workers which hurts wages and non-college educated workers . Two thirds of all new job opening require high school or less. 40% of new college graduates take jobs not requiring 4 year degrees. The government needs to fund infrastructure, but also R&D which would improve productivity, int’l competitiveness and take some pressure off overflowing high skills workers. End the student bankruptcy exemption so market forces work to lower tuition and drive out for profits. Stop federal funding for bloated college spending, make them open the books, make public college free. It’s hard to fight the NRA when leaders are not using American history to defeat the crazy arguments against better law. If one can recall George Washington’s diplomatic but eventual resolute treatment of the Whiskey Rebellion, the arguments of the NRA fall quickly. Also it matters where incitement comes, your oil dollars to fill your SUV and pickup fund Saudi backed propaganda, illegal drugs fund the Taliban, right wing propaganda and talk radio inspires the Oklahoma bomber types, irresponsible (vs hunting) gun culture and overwrought media attention (unintentional glorification) leads to Columbine (who cited Oklahoma in journals).